Go with new and potential clients wherever they may venture when you advertise with this Taylor Falls leather travel kit! 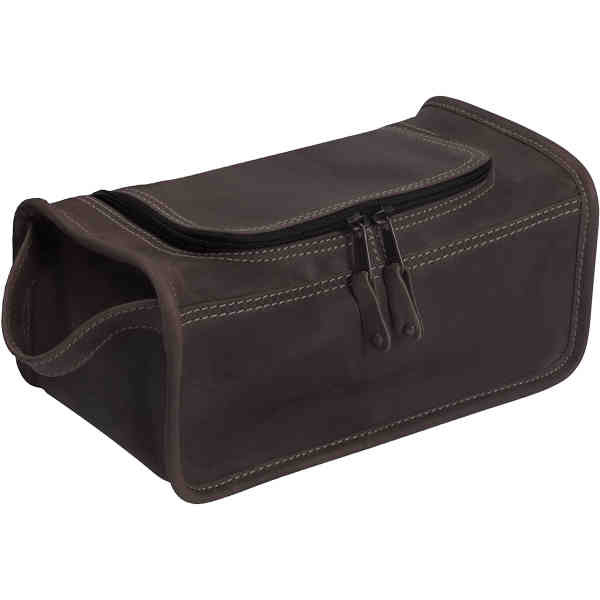 Measuring 10" x 4 1/2" x 5 1/2", the distressed brown buffalo hide leather bag features a top opening for easy access. It has polydrill lining and is easy to grab and go with its 7" carrying handle. Add your name, logo or marketing message before handing it out at tradeshows, bath and body promotions or other marketing opportunities to spread the word about your brand! Size: 10 " x 4 1/2 " x 5 1/2 "
Ship Weight:42 lbs, Orders are normally sent UPS ground, unless otherwise specified. Cost is based on dimensional weight, not actual weight. Shipping weight per 30 units.